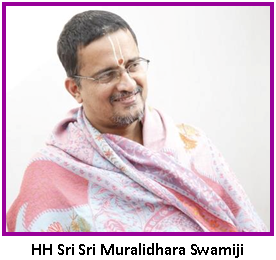 This series chronicles interesting experiences recounted by the devotees of HH Maharanyam Sri Sri Muralidhara Swamiji as well as certain divine experiences of Sri Swamiji himself. 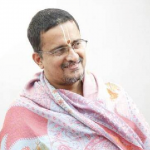 These articles are translations from the series, “Madhuramaana Mahaneeyar” by Dr. A Bhagyanathan, personal secretary to Sri Swamiji, that is published every month in Madhuramurali Tamil monthly magazine. One day, we were all chanting Nama (the Divine Name) at Bhagavata Bhavanam (the main prayer hall at Sri Swamiji’s Madhurapuri Ashram). Sri Swamiji came and sat there. We all sat down around “Namam ketkum Perumal” (the Perumal who stands in the center of the hall listening to the devotees who constantly chant Nama in the hall). Sri Swamiji also began chanting Nama along with us. Suddenly, Sri Swamiji’s facial expression changed. We all continued to watch Sri Swamiji’s face. Sri Swamiji then asked, “Why are all of you staring at me?” We remained silent. “I look afraid and worried. Wondering what could be the reason for that, you are worried. Isn’t that right?” he said. We all nodded our heads. “Many ghosts have come and are sitting around me. They are all scaring me in different ways. What shall I do?” said Sri Swamiji, with eyes filled with tears. “Yes, I am seeing them,” he replied. We did not understand anything. “Perhaps a dead person has come here as a ghost in order to attain salvation?” we ventured. Sri Swamiji said, “No. These ghosts come often in front of me and scare me.” We still did not understand anything. “We have to somehow attain Mukti in this birth. If we don’t attain Liberation in this birth, we don’t know if we will get a human birth next time. Also, we don’t know after how many years we will be reborn, or what the situation of the world will be at that time,” saying this he walked out of the hall. Ever since we listened to these words of his, those ghosts frighten us also now and then! One Response to "Cherished Memoirs 14 – The Ghosts of the World"
What words of wisdom! Jai Gurunath!